Are you considering spending your weekend doing your own carpet cleaning? DETERGENTS: most domestic carpet cleaning machines use detergents. Detergents work by getting dirt and grease to cling to them, but unless you rinse out 100% of the detergent from your carpet you will leave a detergent residue which carries on working, causing rapid re-soiling. Professional carpet cleaning companies don’t use detergents, instead preferring to use treatments which leave no residue! DRYING TIMES: a common issue with domestic carpet cleaning machines is over wetting. This is not only inconvenient but can cause carpet browning and shrinkage! STAIN REMOVAL: Professional carpet cleaners are professionally trained in stain removal and the use of the appropriate stain removal products. Without this professional training, knowledge and experience it is very easy to damage your carpet and this damage is permanent! DEEP DOWN CLEAN: Only professional powerful carpet cleaning equipment will give you a deep steam clean, removing not only dust and dirt but also bacteria, pollen and allergens from deep within the carpet pile. 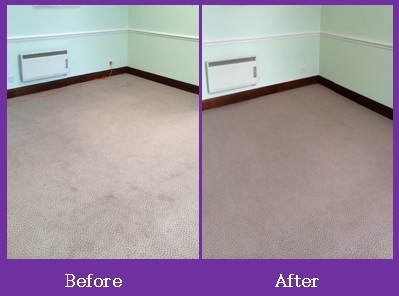 Not only making your carpet look better but also prolonging its life! So, call Karen at Bonne Fresh Clean on 01454 436001 or 07774 908410 for a free no obligation quotation today!